Teaching music to your kids can be daunting to say the least. The questions that you can ask yourself seem endless. Where do you begin? Won’t they offer it in school? Which instrument should I choose for them? How young can they start? The truth is that all these questions are great to ask yet sometimes they may be harder to answer than we think. Let’s try to tackle one at a time and see what we come up with. The unfortunate reality is that music and art programs in primary and secondary schools are taking a hit in funding. This has been true for many years and it doesn’t seem to be changing anytime to soon. Music and art education in school always seem to be the first on the chopping block of funding. If your child is lucky enough to be in a school with a music education program, music class or even recorder class, that is awesome! That’s great news and something that will be of great benefit to them. For those children that are in schools that do not offer any music lessons or instruction, parents must be proactive and bring music into the home. In the ten plus years that we have worked with preschoolers, we have noticed that these preschool years are critical in teaching long lasting concepts. It is during these years that we learn our native tongue and any other languages spoken in the home. I myself learned English and Spanish simultaneously and I will forever be grateful for that experience. Looking back I see how natural it is for many children to learn two or even more languages in the home. This in addition to every other aspect of education that we learn such as shapes, colors, reading and writing. Think of how easily we absorb information during those first few years. It’s amazing actually. 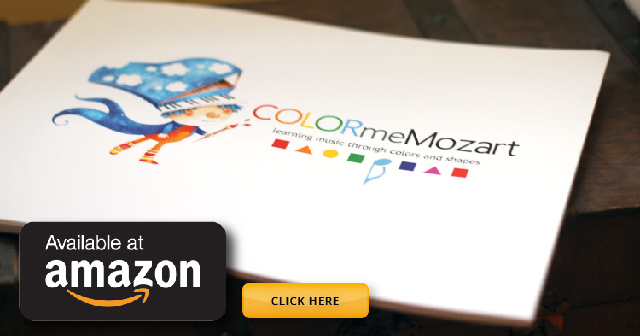 This is precisely what we wanted to take advantage of with Color Me Mozart. By introducing music early in a child’s life, the chances of absorption and immersion are tremendously high. Think of it as a second language spoken in your home. Think of how powerful that becomes for your child. So that solves the question of what to do if they don’t offer music in school. On to the next! How Young Can I Teach My Kids Music? This is a question that comes up a lot. I have great news for you. If your child can recognize colors or shapes, they are ready to learn music. Of course, we’re not talking about writing a symphony but of beginning to absorb music as a language. Think about it, when you were growing up, regardless of the languages you. learned at home, you learned by immersion. Your parents didn’t explain grammar to you or explain what conjugations were. They simply spoke, interacted and immersed you in a language and by default, you now speak, read and write fluently. Teaching your kids music can be done the same way you taught them their primary language. The key is to start early and immerse them in music. How does a child learn the alphabet so well at such an early age, by sheer repetition. It’s everywhere around them, in song and in front of their eyes all the time. Additionally, just about every adult they come in contact with reinforces it again and again. 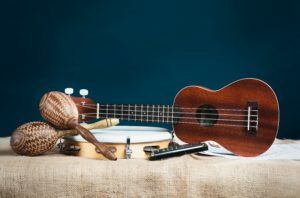 Which Instrument Should I Choose for My Child? Here’s an answer that you may not want to hear, but it’s the truth and one that I am more convinced of after all these years of teaching: It doesn’t matter! Let me explain. When a child is learning to read and write, we don’t think it necessary to choose what type of literature they should read for years to come. the primary goal is to get them to read and write so that they can become proficient enough to have the skill forever. Throughout the years, they will increase their skill level and be able to read any type of book, regardless of genre. When I teach young kids music, it’s the same as teaching them to read and write in their dominant language. When a child learns to read and write music, a whole world of possibilities open up. They will know a language fluently that many only dream of knowing, even as adults. By the time any specific instrument is chosen, they will not be hindered by not speaking the language of music. The barrier to any instrument has been broken making it easier to learn. While I do think the Color Me Mozart music learning system is a great way to teach your kids music 😉 my real advice to is to simply expose your child to music education as early as possible. Even if you may think it too early, it can only be beneficial. Numbers, colors and shapes are an integral part of any child’s educational journey, why not throw music in the mix? Think how much richer their educational experience will be! If your are a family with special needs such as Autism, Down syndrome, ADHD or intellectual disabilities, music can be a great tool of expressions for your children. Be sure to check read out post about music and families with special needs to get more information. In my work as a music therapist for the past ten years I have seen the power of music in the lives of so many families, I highly encourage making music a daly part of any child’s education program.